It’s a sleepless night for Hee-Jin, as she giddily lays in bed at her house, thinking about Boong-Do. She finally can’t take it anymore and gets up, makes her way down to her cosmetic table and pulls out jewelry box. In it she has hidden the talisman. Boong-Do had given it to her after finally returning from Joseon, saying, “I don’t have a use for this anymore so you take care of it.” He had placed it firmly in her hand. Hee-Jin gives a little “hmph” of frustration. Boong-Do asks for a reason since it looks so uncomfortable but Hee-Jin can only answer, “You just wear it. There is no separate reason for wearing neckties.” But Boong-Do can’t understand. People here seem to wear clothes for practicality but he can’t understand the necktie. The purpose of it seems unclear. Hee-Jin’s womanly instincts have finally caught up to her brain. “Ah, there is a reason! There is a purpose for the necktie. Do you want to know?” Of course Boong-Do does. Hee-Jin says, “It’s hard to explain it in words. I’ll come over right now!” Boong-Do is surprised and exclaims, “Now?” but Hee-Jin has already hung up. Hee-Jin calls Boong-Do over to the neckties. She holds the necktie shyly in front of Boong-Do. “Long time ago, wives usually tied this for their husbands who were going off to work. So every morning like this…” Hee-Jin puts the tie around Boong-Do’s neck. “I would tie it for you.” Hee-Jin starts to tie the necktie. “While I tie the necktie…” Hee-Jin looks up furtively at Boong-Do and catches his eyes. “Yes like this. Then our eyes meet like this and a feeling comes. So…” Hee-Jin pulls at the necktie and brings in Boong-Do for a kiss. (KYA!) Smack goes the kissy lips. Hee-Jin can’t lift her head. “See. This is it. This is the purpose of the necktie.” Hee-Jin looks up at Boong-Do expectantly but…! The drama shooting is done for the day and a staff member wants to buy lunch for the actors but Hee-Jin declines. Soo-Kyung asks, “You’re going on a date again?” Hee-Jin is indignant. “What do you mean ‘again’? We have never properly gone on a date.” Soo-Kyung asks, “Then those late night trips…those aren’t dates?” Hee-Jin corrects Soo-Kyung. “I just went for a moment to teach him something.” Soo-Kyung doesn’t believe her but what can she do. She’ll just go by herself to lunch. Hee-Jin says bye but her voice rises in a way that giddy schoolgirls’ voices do. Soo-Kyung stops to remind Hee-Jin about being prudent in public. Hee-Jin swears (but I don’t see her upholding her promise). The waitress brings the menu and Hee-Jin tells Boong-Do she will order something for him- something that won’t be too strange. But Boong-Do has already ordered mushroom cream fettuccini. Hee-Jin asks if he knows what that is. Boong-Do just ordered since he doesn’t think he will die from eating it. Hee-Jin reminds Boong-Do, “You said you wanted to go to Firenze (Florence). They eat this type of food there. You won’t be able to eat anything there if you don’t like this.” Boong-Do tries to hide his worry. “I’m telling you, it’s delicious.” Boong-Do puts down his fork and takes a drink of water. Hee-Jin teases him. “You’re going to stop eating that delicious thing?” Boong-Do lies through his teeth. “I want to savor it since it’s so good.” Hee-Jin offers her food because it is not as buttery but Boong-Do graciously declines. Hee-Jin tries to feed Boong-Do a forkful of her pasta but he declines again. When Hee-Jin pulls out the aegyo, he concedes and takes a forkful. Boong-Do’s face immediately lights up and he quietly, but swiftly, switches plates with Hee-Jin. Hee-Jin bursts out laughing. She also entwines her feet around Boong-Do’s under the table while offering him her pasta. Boong-Do says, “I’ll take care of it so wait. I’ve been thinking about it.” Boong-Do holds up his book. Hee-Jin asks what kind of book it is. 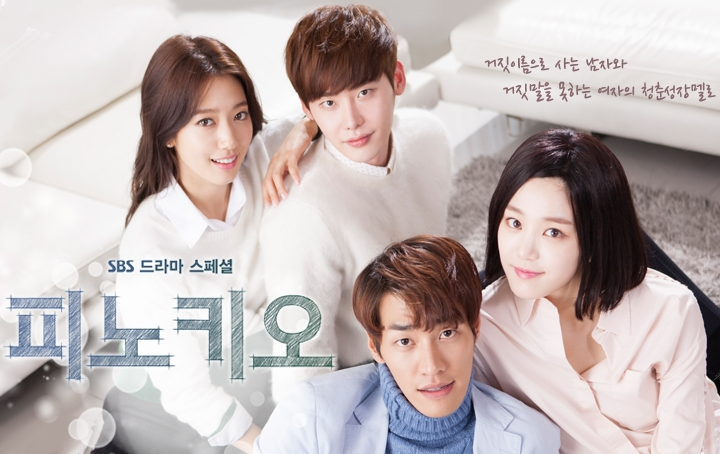 Boong-Do whispers into her ear, “Skills in faking one’s identity.” Hee-Jin scolds him. “You’re on your way to becoming a criminal.” Boong-Do replies, “But there is no other way. I can’t live without an identity.” Hee-Jin quickly and easily agrees. And then with a whoosh, Boong-Do transports back to Joseon. (I’m losing my hair.) Hee-Jin looks back to where Boong-Do should be but doesn’t see him. She panics and looks around the park. Boong-Do is looking around in his own time when suddenly the talisman falls from the sky at his feet. (So wait, Boong-Do just can’t stay in the future? NO!!!!!!!!!!!!!!!!!!!!!!!!!!) 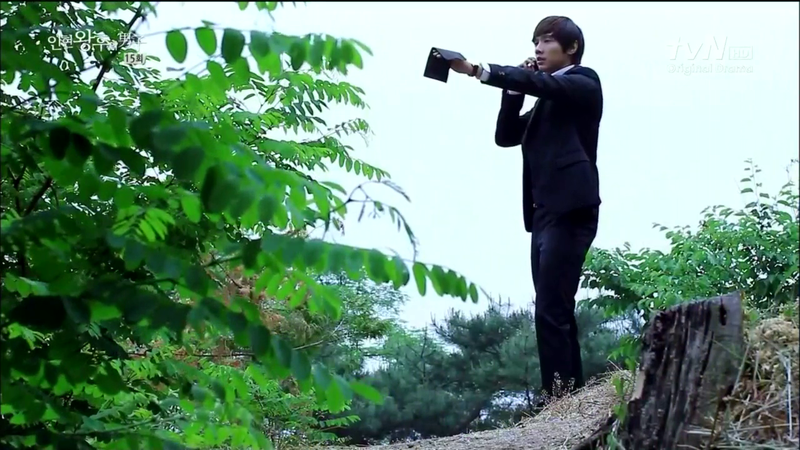 Hee-Jin continues to look for Boong-Do. “What is this?” She calls Boong-Do but the automated message says, “This number does not exist. Please check again.” (WHAT DO YOU MEAN IT DOESN’T EXIST?????!!!!!!!!) Hee-Jin looks at her phone curiously and quickly tries again. Soo-Kyung has just come home and is regretting eating so much. Hee-Jin calls and asks her to check her jewelry box. Soo-Kyung looks for a talisman but can’t find it. Hee-Jin asks her to check again. She is sure she put the talisman in the box. 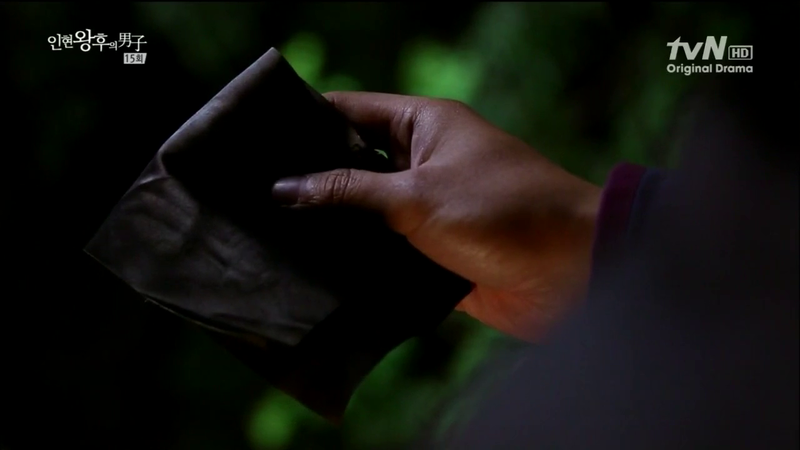 Soo-Kyung tells her there is nothing there that resembles a talisman or a yellow envelope. Hee-Jin collapses on her knees. 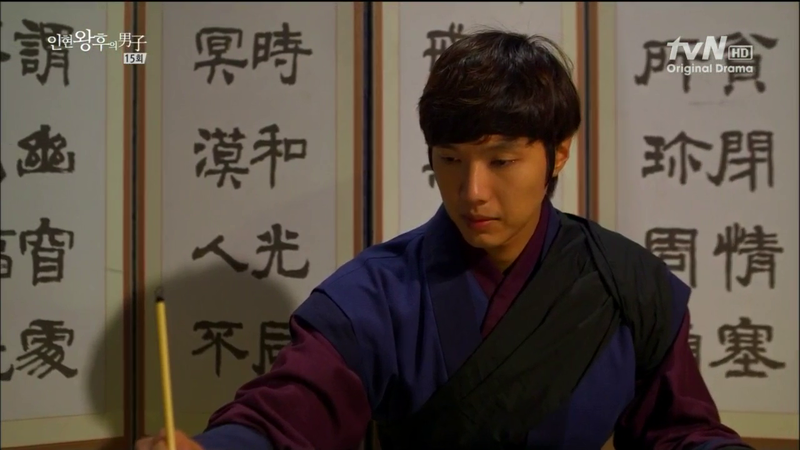 Boong-Do also remembers what Yoon-Wol said the monk told her as he wrote the talisman. “Just because I wrote it, you asked for it, or he owns it, doesn’t mean that the talisman will do what we want.” Boong-Do remembers Han-Dong telling him that Yoon-Wol went back to the gisaeng house. Boong-Do proceeds to change out his modern clothes. It is the gisaeng house and a tall man approaches a tipsy gisaeng. It is Boong-Do asking for Yoon-Wol’s whereabouts. The gisaeng notes his good looks and jealously replies that Yoon-Wol is busy. Boong-Do opens the door to Yoon-Wol’s room and sees blood splattered on the walls and smeared on the floor. (I. can’t. take. it. any. more. Tell me it’s a happy ending. TELL ME!). Boong-Do follows the blood trails and finds Yoon-Wol’s hairpin on the stairs. He continues to follow the trail, cautiously at first, then faster and faster, until he sees another pin and ribbon. He follows the blood trail again until he sees a figure, bloody and lifeless by the stairs. Boong-Do takes of his hat and kneels by the figure. He softly whispers “Yoon-Wol ah” and feels for a pulse. There is none and Boong-Do starts to break down. 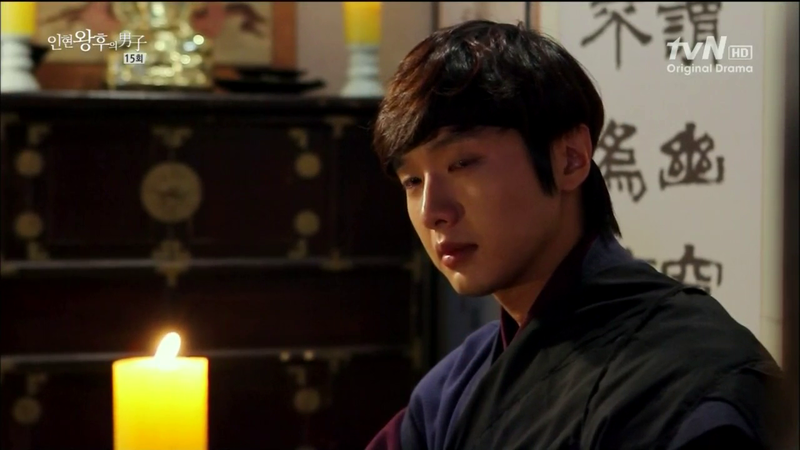 In a flashback, we see Ja-Soo at the gisaeng house, angrily drinking. He leaves his room with a bottle of soju when he sees Yoon-Wol walking to her room with her gayageum. Ja-Soo opens the door to Yoon-Wol’s room. She asks in surprise, “Who are you?” Ja-Soo says, “Now that my master is dead, you have no worries, right? 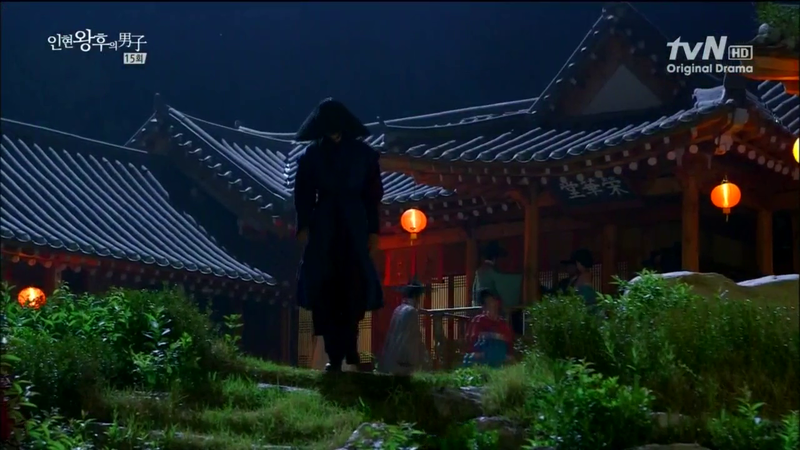 That’s why you are back here without fear.” Ja-Soo menacingly walks toward Yoon-Wol. 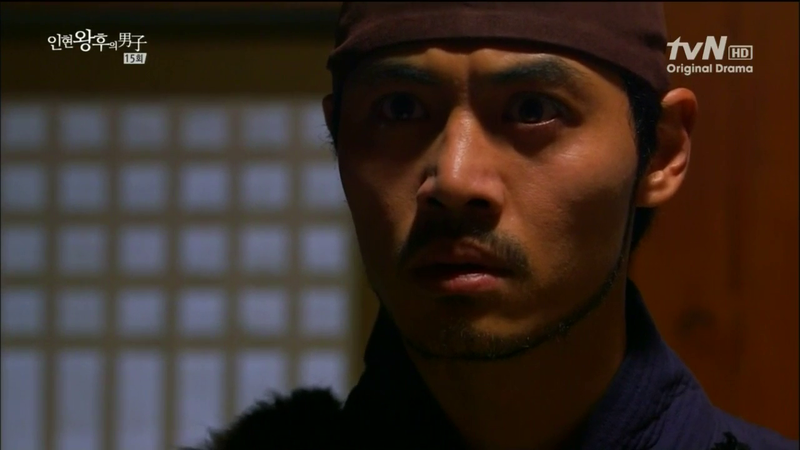 “If it wasn’t for you, things wouldn’t have turned out this way.” Yoon-Wol warns him, “Don’t come near me. I’ll call for help.” (Please don’t show me Ja-Soo killing her. Please!) Ja-Soo laughs at the suggestion. Yoon-Wol asks Ja-Soo if he isn’t afraid of the consequences since officers are hunting him. Ja-Soo replies, “Consequences? The person who should have been of afraid of the consequences is YOU!” Yoon-Wol’s throat is cut and she is dragged out. Boong-Do cries her name again, “Yoon-Wol ah” and places her pin back in her hair. Boong-Do looks at her blood, staining his fingers. Boong-Do stops a servant and asks for a guest that has a sword. Ja-Soo is in no mood to play with gisaengs and wants to leave. His room door opens and there stands Boong-Do, his bloody hand tightly clutching his sword. Boong-Do takes off his hat and reveals himself to Ja-Soo. There is anger and wrath in his eyes. Ja-Soo is surprised. “Aren’t you dead? This is better. I will kill you with my own hands.” Boong-Do and Ja-Soo start to fight and Boong-Do with his wrath are able to take down all the other men. 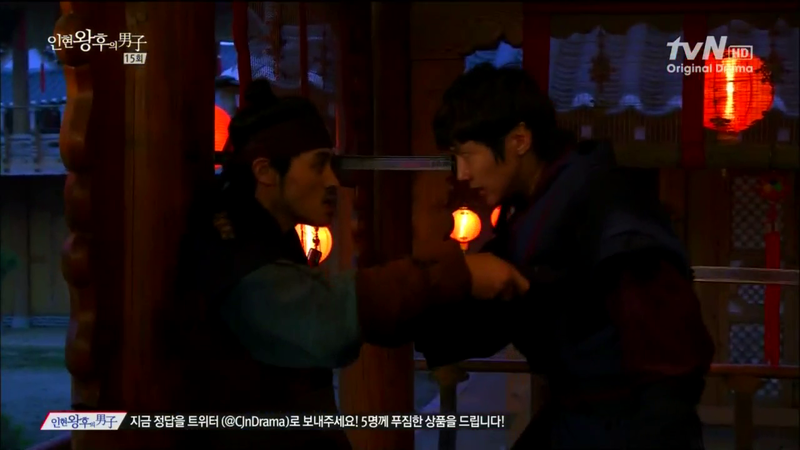 Ja-Soo and Boong-Do take the fight outside and Ja-Soo is able to slice Boong-Do in his shoulder. They continue their battle and it looks like Ja-Soo has the upper hand. Boong-Do roars in anger (rawr!) and attacks but Ja-Soo once again slices Boong-Do on the leg. Boong-Do falls to his feet and the two men stand sword to sword. 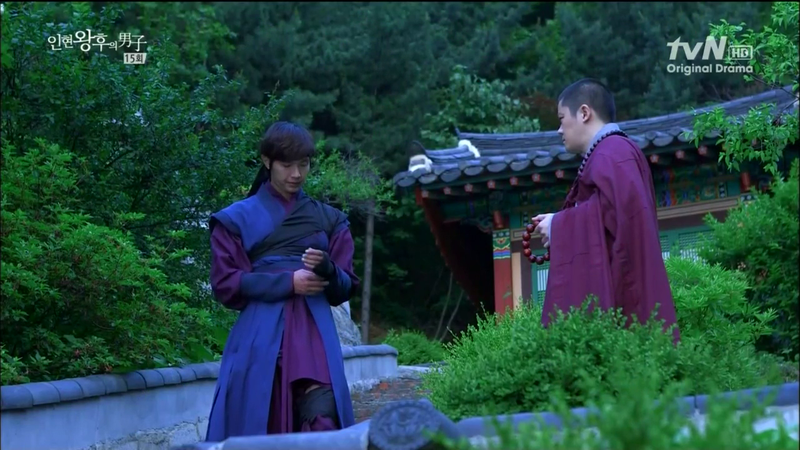 Boong-Do suddenly pulls away his sword to allow Ja-Soo’s sword to fall at his neck. It seems for a moment that Boong-Do just wants Ja-Soo to kill him but Boong-Do pushes the sword away with his BARE HANDS, and throws his own at Ja-Soo’s head. It misses but latches itself on the column behind Ja-Soo. Boong-Do, swordless, walks menacingly towards Ja-Soo. Ja-Soo points his sword at Boong-Do and as Boong-Do continues to walk toward him, Ja-Soo pushes his sword into Boong-Do’s shoulder. Close enough now to see the full white of Ja-Soo’s eyes, Boong-Do pulls out his own sword from the column and slits Ja-Soo’s throat. Ja-Soo falls, dead. Boong-Do collapses next to him, a sword sticking out through his body. Everyone else has left the park but Hee-Jin is still waiting. 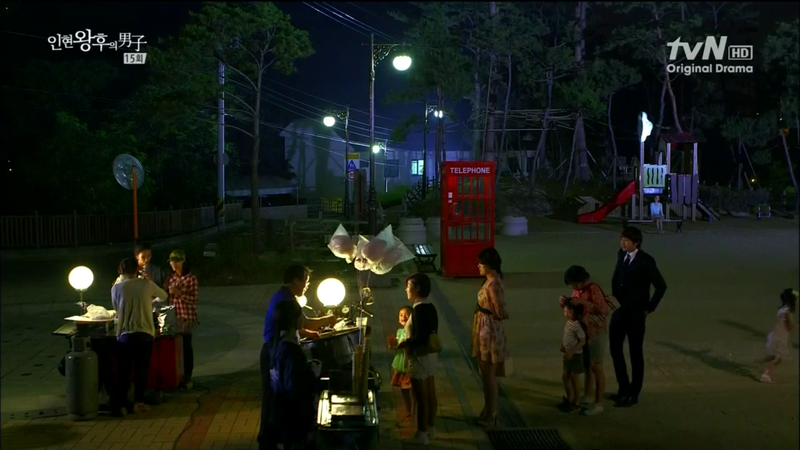 Soo-Kyung calls but Hee-Jin doesn’t pick up. She just continues to wait. (Boong-Do, Boong-Do, Boong-Do, Boong-Do, please, please, please, please!). It is morning at the gisaeng house and the investigators have arrived at the scene and they are labeling the victims. A lower rank officer reports to the head that they are looking into the identity of the dead people. No one knows yet who the suspect is but he looked for someone named Yoon-Wol first. Yoon-Wol is also dead, however. Boong-Do is back in modern time at the park. He pulls out his phone to see if it works. It does! Hee-Jin’s phone rings and she quickly picks up. “Where are you?” Boong-Do replies, as tears start to rise in his throat, “I’m sorry I surprised you. Where are you?” Hee-Jin tearfully answers, “At the park.” (I just love Hee-Jin. She doesn’t run around all dramatic and frantic but instead simply replies, knowing he will find her.) 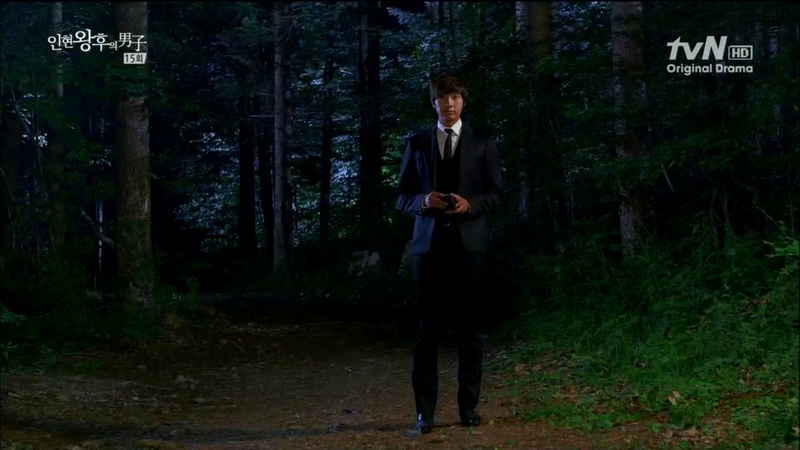 Boong-Do repeats, “The park?” and he looks down from the hill to see her. 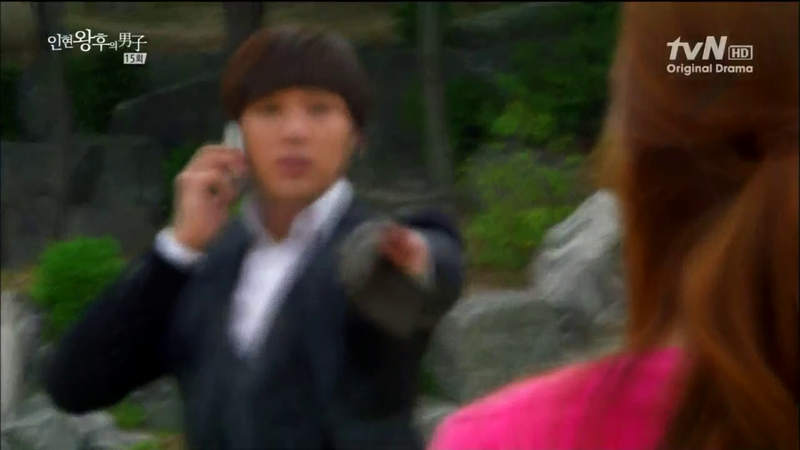 Hee-Jin drops her phone and runs to where Boong-Do last stood. (Guys, I’m continuing this after literally sobbing in the bathroom, crouching in the darkness.) 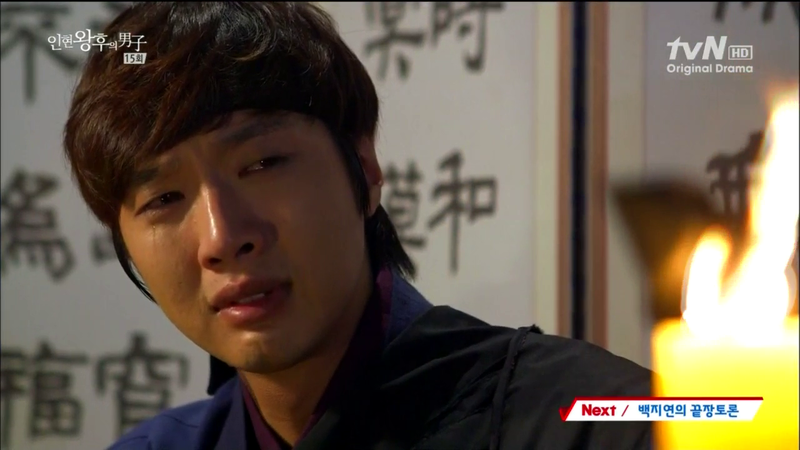 Hee-Jin cries while Boong-Do falls to knees, tears falling quietly out of his eyes. It is night and Boong-Do is speaking to Young-Myung monk. “Since I am being chased, I don’t think it’s a bad idea to go far away.” Young-Myung monk wonders if the monk who wrote the talisman will be able to help. Boong-Do replies that it is the only option left. He has to find him. Boong-Do is traveling to find the monk. He stops to rest for short bits as he continuously rides away. Subtitle says “One month later.” (OH GOD!) It is the television station and Hee-Jin is walking lifelessly out of it. Dong-Min passes by her and takes notice. Boong-Do has finally reached the temple where the monk who wrote the talisman is supposed to be. (Cars, trains, airplanes….Oh god. I’m so thankful for them. The monk’s name is Sung-Myung, by the way.) 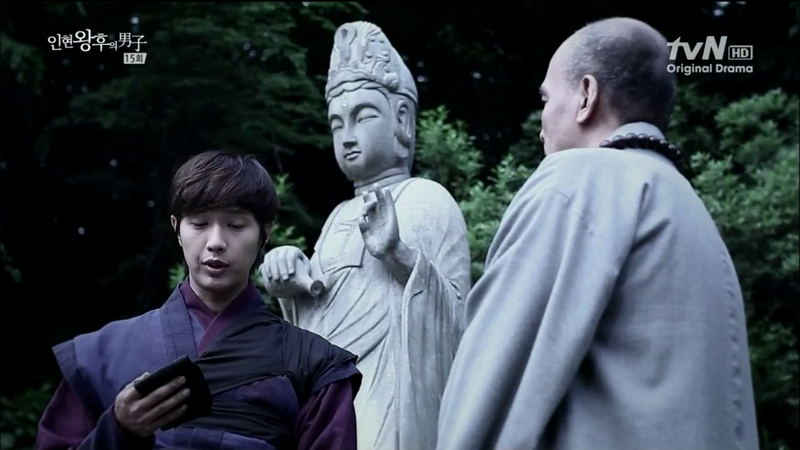 Another monk informs him that Sung-Myung monk *EDITED* has died. (…………….I don’t even have words to describe how I feel anymore…………) Boong-Do steps back in despair. The sun is setting and Boong-Do lies helplessly on the hillside. He remembers Hee-Jin crying, asking where she should have wait for him if not the park, what happened, and where did he go? Tears fall silently down his face. It is dark now. Boong-Do pulls out the black talisman. He had told the monk that the talisman was once split in half and in the other world, everything returned to its starting point- the time when he didn’t exist. Except that person, everyone forgot him. So he is curious. What if he burns the talisman? Will that person completely forget him too this time? Boong-Do is at a desk, writing a letter. “This is letter written both to me and you. I may forget that I even wrote this letter, or this letter itself might disappear. This letter is for me and you, either one of us who may live on holding onto memories. When I obtained this amulet by chance, I wanted to know what the cause and effect/reason was. First, I thought the reason was so that I would be able to fulfill my dream. Then I thought perhaps the reason was our fateful meeting. Then I thought it must be for me to live in a new world. But now I have finally realized the real cause and effect. In order to save my own life, I would have to lose everything. My future, my name, my values… my people…and also you. In order to save my own life, I must lose everything…it is probably the most logical end. I was foolish to think I could at least have one thing. How much must I lose in order to repay the debt of my life? Never being able to see you again? I have realized even that is a luxury. Hee-Jin has been crying at the park this whole time, oblivious to the rain pouring on her, as her tears blend in with the thick droplets on her face. Hee-Jin walks into her house, drenching wet. Soo-Kyung worries after her. Hee-Jin just walks into the bathroom. 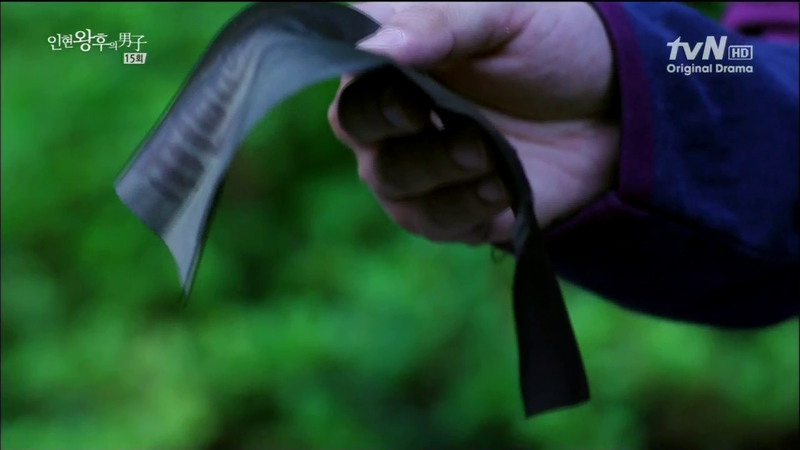 Boong-Do folds the letter and pulls out the talisman. He brings the talisman over to candle and lights it on fire. The talisman burns. Guys, I’ve been holding it together while typing that letter but the result is now I’m shaking and this screen is getting blurry as I type. The single sliver of hope is that we don’t know yet for sure that burning the talisman will have everyone lose his or her memories. But from the sound of letter, I think it is the most likely thing. I dread that happening. You don’t know how much. But it makes so much sense. Everything makes so much sense, it angers me. It makes me into a sobbing mess because there just couldn’t be any other thing for Boong-Do to do but to burn the talisman. I apologize if these comments are more emotional than analytical right now but I am seriously crying over here. 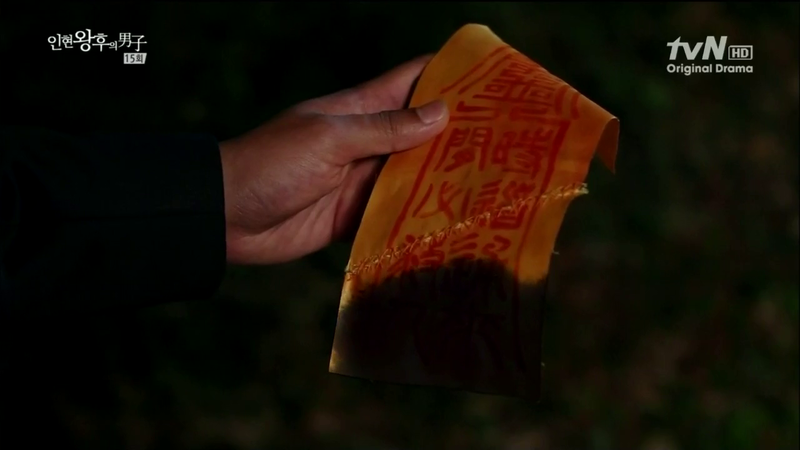 I love how the issue of burning the talisman is not a question of trying to get someone to remain in the future, like it was for Hee-Jin, or a question of the fear of losing memories. Rather, right now for Boong-Do, it is a question of love and sorrow, about Hee-Jin waiting for him, unable to forget and move on. If before, he feared losing memories, now he is afraid they will remain. The letter is so beautiful and I really wanted to do it justice. I don’t know. I’m just crying here. Yoon-Wol, our poor beautiful Yoon-Wol. Her death nearly killed me because I didn’t even expect her to die. I thought the talisman either continues to be a source of problems or for it to be transformed due to Boong-Do’s desire, not Yoon-Wol’s death. I still can’t believe she died. You don’t kill off such beautiful human beings. You just don’t! Talk to me people. I can’t finish this comment section properly right now, without delaying the recap, so leave your comments, so I can get help thinking this episode through. *EDIT* A kind reader, Dyu, pointed out my error and corrected me. Sung-Myung monk did not go on a pilgrimage. He died. This makes so much sense. So the first time Boong-Do went back, it was because Yoon-Wol died and the second time he went back was when the monk died. That’s why Boong-Do remembering what Yoon-Wol said about how the talisman was made through people’s will/desire was important. Someone give this writer an award. Why drama twists are always at the end? joonni.. thank you for your fast recaps… my heart broken read this episode. after that wonderfull memories suddenly they separate… please… a happy ending… please… please… please…. Joonni, seriously, what would I have done without your recaps?? the biggest thank you EVER!! This ep was really something, the most amazing thing for me is how smart the writer is!!! I never thought about YW’s importance for the talisman! this is like “reality” hitting me!!! this writer is always surprising me, even with very simple facts! For example, in the 12th ep, when Bung Do got mad because he thought Hee Jin threw the talisman, I didn’t even thought about the effect that it would have on their lives, but just focused on Bung Do’s will to get back to joeson again! I have been putting my brains thru the ringer to come up with a way BD can get back – nada, nyet, nothing!! – which is soooo depressing. On top of it all THE monk is dead!!! thank you for the recap! I don’t know what will happen but please no memory loss and reincarnation! I hated RTP ending. 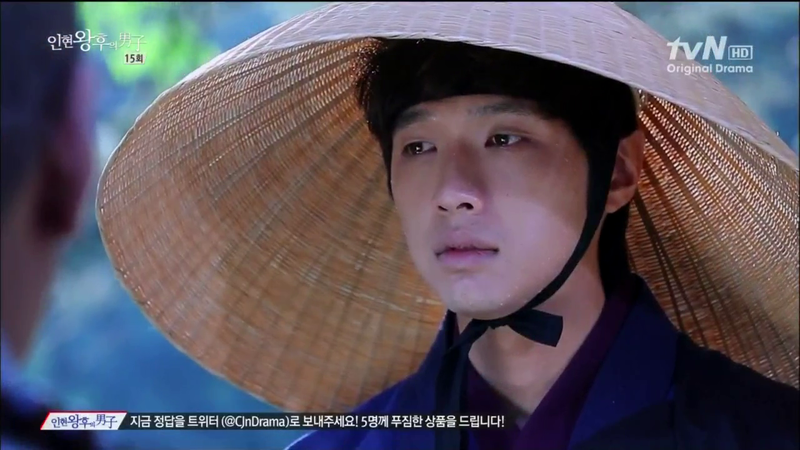 I don’t even want to think that BD will live alone in joseon. But, I don’t feel good about that letter feels a lot like Lee Gak’s. thanks for sharing the song. yes, it’s very fitting for this episode. if this is end the sad ending , i don’t start new drama. i will watch firstly its last episode . i will decide next , watch or not . what is this?. i am in depression . poor me. Ha ha! I am like that too. K2H, RTP and now if this ends up sad. I will quit watching k-dramas. My heart can’t take sad endings anymore! 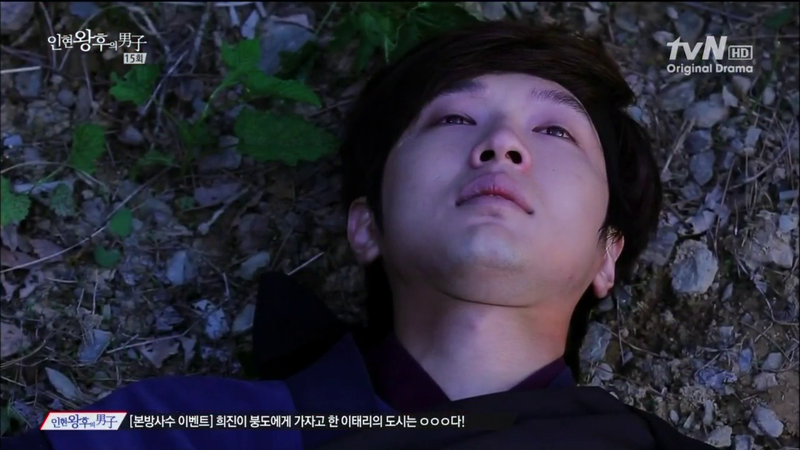 gah…the last scene is so heartbreaking… poor Boong Do. This time it’s worst than when I thought he had died in ep 14. The pain and love that are intertwined with the letter he was writing just breaks my heart. I’m praying that we’ll hear the song “I’m going to meet you right now” by Deok Hwan in the episode tonight. CAn’t wait!!! also, thank you Joonni for writing out the recap so beautifully. I actually cried again while reading your last part of the recap even though i already watched the ep. Thank you. Although I think it’s more the scene itself than my writing. I did try to not to get in the way of the drama itself. I’m glad it worked. They said that we will be “touched” when the drama ends…. oh wait is this going to be like Hachiko movie where the dog waits for his master for years until his last breathe….. OH HELL NO!!!! or Somewhere in Time where they meet in heaven? or Kate and Leopold? argh… my mind hurts! First off, thank you joonni for giving us an early recap of this episode. I totally appreciate it because many of us have been anticipating the next episode since last week. I have been silently reading your recaps since QIHM started but this is my first time to comment. I just want to show you my gratitude for all your hard work in sharing us this drama almost in real time. Second, I’m going to say sorry for the long comment beforehand but I just couldn’t express myself properly right now. I’m one step closer to breaking out. I already told myself before reading this recap to be brave and to compose myself properly since I am reading this in the office while keeping busy with work. However, I totally got the wrong end of the stick. I knew that after setting my heart aflutter, heartbreaking moments will come soon…but not like this. I guess the writer wanted to give Boong Do some reality check with such painful realization of this “cause and effect” principle. I know it wasn’t exactly what he expected to happen. Nobody would want that but it was just harsh to be left only with memories…just memories. 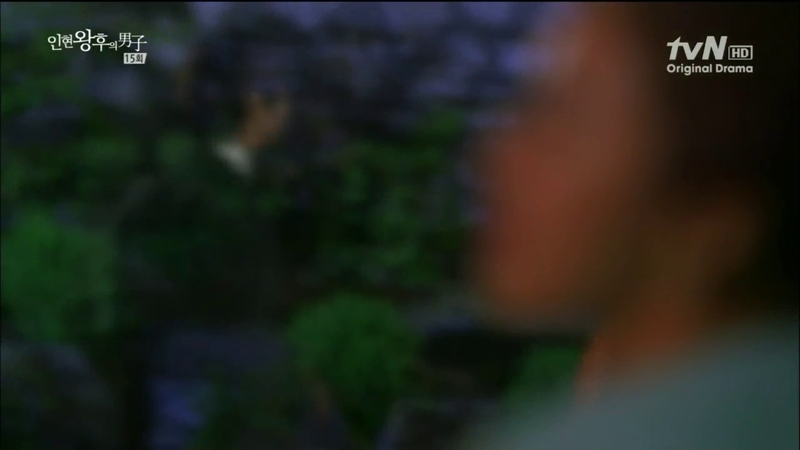 Boong Do has Hee Jin in his heart but all he can do is remember…so is Hee Jin and that is what’s excruciating! For a while, I thought our lovely Yoon Wol’s story was over but I was totally wrong. It seemed that everything was connected to her and the talisman, after all. She was this fairy godmother who sent Boong Do to Hee jin and vice-versa and now that she’s gone, our OTP just couldn’t be together anymore. So sad…my heart grieves for her. I just hope that burning the talisman will give a negative effect. The act of Boong Do burning the talisman is complete sacrifice from his heart’s true desires and in a way killing himself. He’s letting himself die by letting Hee Jin go so that she could gain her life back…without any trace of him. Thank you for your comment. I love your description of Yoon-Wol as the fairy godmother. Her death was one of the hardest thing in this episode to digest. Gee thanks! I could only think of the best for Yoon Wol since she was the most unselfish Kdrama character I have encountered ever. Unlike others, she did not let her pain over an unrequited love turn into hate. She’s truly one amazing woman! In my experience of watching k-dramas, there have been three other deaths that have shaken me thoroughly, so much that I had to step away from k-dramas for a while after each one of them: Sandglass, Let’s Go To School Sangdoo!, and A Love To Kill. Yoon Wol’s death – I can’t even respond to it in English. Only Korean is coming to me. 그건 너무인거 아니에요? 말도 안돼… Her death seriously makes me want to rage at the injustice of life. Damn it, would it have been too much to grant her a chance at a decent life in modern Korea? Yes, I totally realize how the narrative is built on her being sacrificed, but damn it! I have to have a happy ending. For Yoon Wol to lose her life in such a 비참한 manner, there needs to be pay off. Otherwise, it’s doubly insulting to her sacrifice. Jooni, you’ve done a marvelous job. This drama is dae bak. Because of work-related time constraints, I had saved episodes 12 – 15 to watch tonight. I wanted to be caught up in real time with the show’s broadcast. When I got to episode 14, I didn’t know what dramatic tension remained to make the last 2 episodes the climax. Well, I got so much more than I imagined possible. The writer(s) is/are brilliant. I hope this drama (along with TvN’s previous offering, Shut Up Flower Boy Band) changes the rules of the game for k-drama writing. 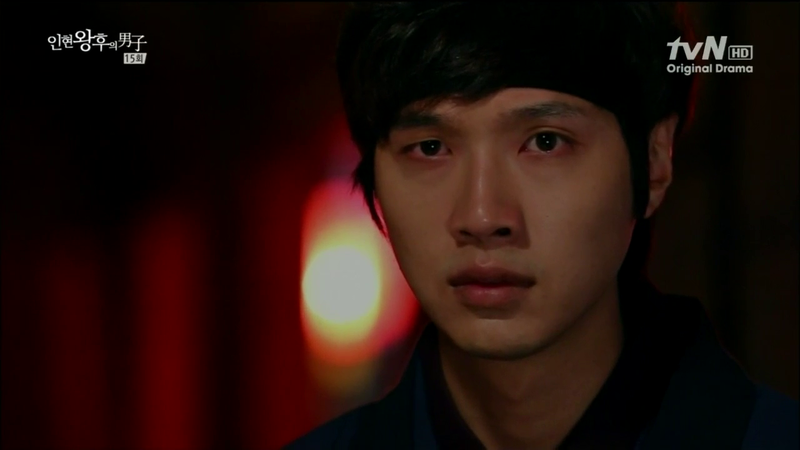 Unrelated – The final scenes of Boongdo tearing up – Ji Hyun Woo is dae bak. My mind’s still numb. I read your recap before I went to bed but I was too exhausted from all the twist of the emotional roller-coaster to comment anything. I was vividly shaking and trembling at the ending, and after reading your translation of the letter from Boong-do to Hee-jin I could not take it anymore. All I could do was to go to bed so Ep16 can come faster. I know I’m not the only one yelling at this scene. I was horrified, NO NO NO, Boong-do, please don’t do that. He was even not sure about the power of the talisman anymore, but he still did it. It was insane! He was driving us crazy. I still can’t believe the writer explained all BD’s back-and-forth actions in that way. She’s a genius. But she’s too evil to us. As always, you did an excellent job, Joonni. How could you recap that fast? with every tiny detail, multiple screencaps, and then inserting, resizing them, etc…., and you’re still able to express your insightful thoughts in such a short time. I know how tiresome to complete a recap, so I’m in awe of how you can always feed us with your quality recaps at the speed of light. *Bowing my head* and thank you so much, Joonni! 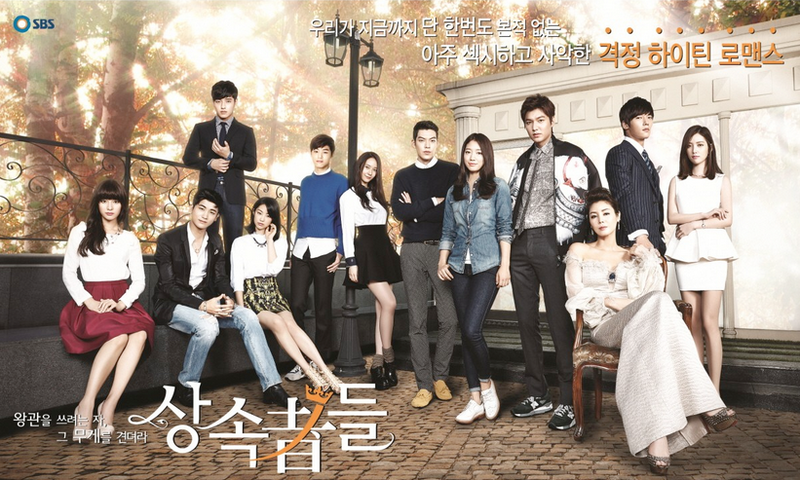 Joonni, this is the first K-drama am watching and I feel lucky to have started with Queen Inhyun’s man. This is a fantastic drama and reading your (excellently written) recap has me in tears. I identify with every emotion of yours that you have shared with us. I was taking a breather from writing an article introducing/recommending this show to our readers, for an Indian website I write for and the curiosity got the better of me and stopped to read the review. Thank you for I wouldn’t have lasted till the video with English subtitles is out. I know (I fervently hope) it is going to be ‘happily lived ever after’ for Boong-do and Hee-Jin. I cannot and won’t accept anything less but i cannot but admire the way the writers have meticulously used every scene, every dialogues from the previous episodes to build it into an awesome climax. They are ensuring that they close every loop they opened. Now that i have had the taste of Korean Dramas am thirsting for more. Am guessing you write for other shows too so will keep in touch. Looking forward to finding such gems (like this show) and sharing it with our Indian viewers. Neeru, That is rather unfortunate. There is nothing out there that can match up to this. If you want to collaborate on hindi subtitles, I am game. Let me clarify my statement. The average Korean shows are Way better than the Hindi serials. There are many which you can promote on your website which are very worth watching as well. However, if you lead in with this one, you set the bar at a level that Korean dramas are just attaining. While you are at it, check out some Japanese dramas as well. There are some doozies out there. Try Long Vacation. okay, I’ve watched quite a lot of dramas up until now and I have to say that the only time I ever cried over one was while I was watching Hana Kimi… but now this episode came along… I can’t even put into words how hard I was crying while watching this episode! I want/need a happy end so badly!!! I am not able to comment, even after 18 hours. I haven’t read any of the previews, or guesses on the end because I don’t want to know. It just hurts so much . Thanks for the recap, and here is an ((e-HUG)) for you. HOLY….!!!!! Oh. My. God! How can this writer be so awesome? Seriously?! Even if everyone’s a blubbering mess. I didn’t even think of the possibility of what would happen to the talisman if Yoon-wol died (her death was soo heartwrenching!). This episode is like multiple personality disorder on crack! First, we’re all falling over hysterically over Hee-jin’s antics for excuses to kiss Boong-do (and his awesome responses), and then we’re crouched over hysterically crying and trying to stay alive after that heartache. I can’t even describe what would happen to me if they lost their memories of each other. I’m still holding out hope for a happy ending based on the first episode of the series though. Let me go cry my heart out some more now. Also, thank you so much for this recap. That one was probably your most difficult one yet, and we really appreciate you trucking through it. JOONNI oh Joonni – never thought that the talisman would be negated this way!! The writer is really “sneaky” (in a good sense) and played with our emotions and is playing a cat and mouse game with us all!! But is is a SUPER episode. Who would have imagined that the death of Yoon Wol (that was tragic and I have never expected this to happen) would bring about the separation of our lovers – more like should have thought about it as she was the one who prayed night and day for days for the talisman!! It was a refreshing movement of plot – this I must admit. Let’s see what else the writer has up his/her sleeve for the final episode. What a ride!! Loved it. Thanks so much for the recaps Joonni. Thank you so much for your insightful and passionate recaps. I wouldn’t have been able to understand the show otherwise. You have created a cult following. I look forward to your next project. No matter how this show ends, the shared experience of watching was unforgettable. The perfection that is this drama continued. I feel the recaps prepared me for the heartaches but nothing could prepare me for Yun Wol’s death!